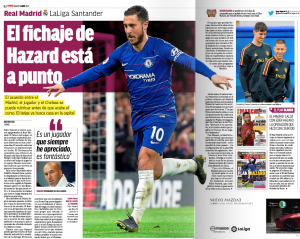 Despite Eden Hazard being linked to Real Madrid since transfer rumours were invented, the media closest to the Spanish club don’t often go really big on it. Sure, the Chelsea player has been the subject of Marca front pages, but not as many as you may think, and usually down to his flirting with Madrid. Hazard gets the front page and the Spanish newspaper talk up a transfer closing in the for the summer window. Hazard is taking ‘giant steps’ towards his Real Madrid move. The player’s future can be ‘sealed definitively in the coming days’. Agreement between Chelsea, Madrid and Hazard ‘is practically a fact’. Chelsea understand their player is leaving. ‘Everything indicates’ Hazard will get his Madrid desire this summer. The Belgian plans to travel to Madrid soon to check out areas to live. A six year contract would be in the offing. Zidane only decided on the transfer last week. ‘If nothing gets twisted’, Hazard will be the first signing of the summer. You’ve probably noticed something missing there… how much. Despite saying ‘around €100m’ on their front page, Marca don’t mention money in their main article. There’s a separate snippet dealing with Chelsea negotiations. 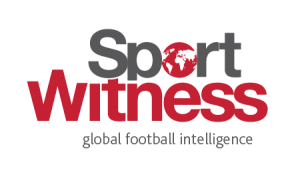 It’s explained they’re using the Thibaut Courtois model, and getting Hazard for €100m, with Chelsea under pressure to sell.